Before starting actual talk on Best home loan interest rate comparison, let me share one incident with you. Manish employee of MNC Company has recently got transferred in Mumbai, and he is planning to purchase a dream home in the Mumbai. After doing a property search for several days he realized that buying a home without taking a home loan is extremely difficult for him. It is the case with everyone. We cannot imagine buying a home without taking a home loan. When we explore the home loan market, we find that every bank is eager to lend money to us. Home loan jargons confused us and it becomes extremely difficult for us to select Best Home Loan. So, in order to help you in solving this difficulty, here is Best home loan interest rate Comparison and a list of factors you must consider before taking a home loan. A first important factor to consider before taking a home loan is fixed on Floating rate loan. If you opt for fixed interest home loan, the interest rate remains fixed throughout the tenure of the home loan. However, in floating rate loan interest rate changes every quarter and it depends on market condition. 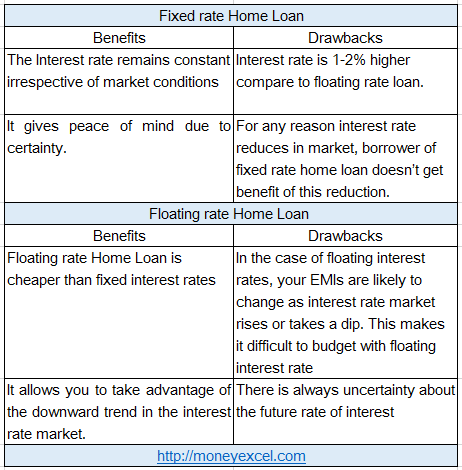 Benefit and Drawback of fixed and floating rate home loan are given below. Looking at current market conditions it is advisable to opt for floating rate home loan option. The interest rate is primary factor you should consider before taking a home loan. Apart from this, you should also look at interest rate history. Look at past 10-year interest history before taking any decision. You can get this information from the respective bank site. Interest rate history helps you in taking better decision. There is no free lunch in the world. An extra element of cost is always attached with home loan either directly or indirectly. We always look at direct cost and forget indirect cost which is hidden. Hidden charges make home loan costlier. Consider following hidden charges before taking a home loan. 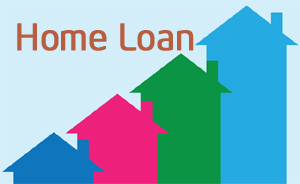 Home loan tenure also plays an important role while taking a home loan. Keep in mind when you go for a longer duration, the home loan becomes costlier. So, always tries to minimize your home loan tenure while taking a home loan. You need to carry out a good amount of research before finalizing the home loan. You can take opinions from your friends and relatives about their experience about a home loan. The Best home loan interest rate comparison is given below. Why new customer is offered with lower interest rate compare to existing? I have taken home loan from the bank before 3 years. At present bank is charging me 11.5% interest rate. However, a bank is offering a new home loan with much lower interest rate 9.40% to new the customer. Why existing customer like me are charged with higher interest rate? This is a very common question. Answer of this question is quite simple. Bank is offering a home loan based on current applicable interest rate. The interest rate is variable and depends on multiple factors. First, let us understand how bank decides home loan lending rate. As per new system introduced in April 2016 by RBI, all banks are using MCLR for a lending fund. MCLR is Marginal Cost of Funds based Lending Rate. As multiple variable factors are involved while calculating interest rate you will find a difference in Interest rate offered by various banks. So, if a bank has MCLR of 9.15% and spread of 0.25% the bank will offer home loan @9.4%. The bank is offering lower interest rate to the new customer because MCLR or spread is changed or reduced. Why Bank take conversation fees to reduce home loan interest? You can reduce your home loan interest rate by paying conversation fees to the bank. By paying this fees you can convert your existing adjustable rate to current adjustable rate. Bank will take conversation fees to fulfill gap of change in the spread. You should avail this offer only if you have large outstanding loan balance or long tenure left for the repayment of a home loan. Why reduction in outstanding is very low during the starting period of home loan? If you carefully observe your home loan statement you will be surprised to note that reduction in outstanding will be very low during the starting period. This is because interest component will be very high at the initial stage. Interest amount will be calculated on the whole amount during the initial stage. In first five years, only a few percentage of EMI will go towards paying the principal. So, your principal will reduce at a lower rate. Why you should make prepayment of Home Loan? You should make maximum prepayment at the initial stage. The prepayment at initial stage helps to reduce the amount payable towards interest. A reduction in the amount paid towards interest means saving of money. I hope Best Home Loan Interest rate comparison chart and points given above will help you in selecting a best home loan. If you have any query related to home loan, feel free to ask. I will try my level best to answer those.